INDIANAPOLIS - Texas Gov. Rick Perry on Wednesday previewed a speech he will give Friday on domestic energy production that will call for all-of-the-above approach to reduce the country's dependence on foreign oil, including drilling in Alaska's Arctic National Wildlife Refuge and a return to 2007 permitting levels in the Gulf of Mexico. Speaking to a crowd of Hoosier State Republicans, Perry accused the Obama administration of siding with environmental activists at the expense of the economy. "The next economic boom is right under our feet. Our own oil resources alone are vast enough to meet the next 300 years of energy demand at today's levels," he said. "... And what has been this administration's response to our energy potential? They've thrown up every bureaucratic obstacle possible in order to advance an activist agenda." Perry outlined some of his energy proposals in an op-ed in the New Hampshire Union Leader on Monday, promising to create 1.2 million U.S. jobs. He also sought to make the issue -- at times awkwardly -- the focus of his remarks during Tuesday's presidential debate. In front of his audience of roughly 200 Indiana Republicans, Perry also condemned Iran for its suspected involvement in a plot to kill the Saudi Arabian ambassador to the U.S.
"Iran, again, has demonstrated how its engagement in the world community consists of plotting violence and terror against its neighbors and its critics," Perry said. "Unfortunately, this is all too often business as usual for Iran." He said it was critical that the U.S. and its allies prevent Iran from obtaining nuclear weapons, but also stressed the importance of securing the border with Mexico. The alleged attack would reportedly have been carried out by a Mexican drug cartel. The governor has sought to draw differences between himself and President Obama on foreign policy, including previous remarks that criticized the president for not vocally supporting revolutionaries during the contested 2009 election in that country. Notably absent from the speech were his usual attacks on the health care plan passed by Republican front runner Mitt Romney. All week, Perry's campaign has been reiterating the ties between the Massachusetts governor's plan and the one signed by Obama. But in Indianapolis, Perry chose to focus his attacks solely on the president, a sign of what will come in his energy and jobs speech Friday. Perry also deviated from his usual stump speech, which is heavy on economics and jobs, to include some of the language he used when speaking with conservative activists at the Values Voters Summit in Washington, D.C. last Friday. "For more than a generation, our culture has emphasized a message of self-indulgence at the expense of social obligation, and we've reaped the consequences in the forms of teen pregnancies, divorced and broken families, the cycle of incarceration that brings fathers and sons together behind bars," he said. 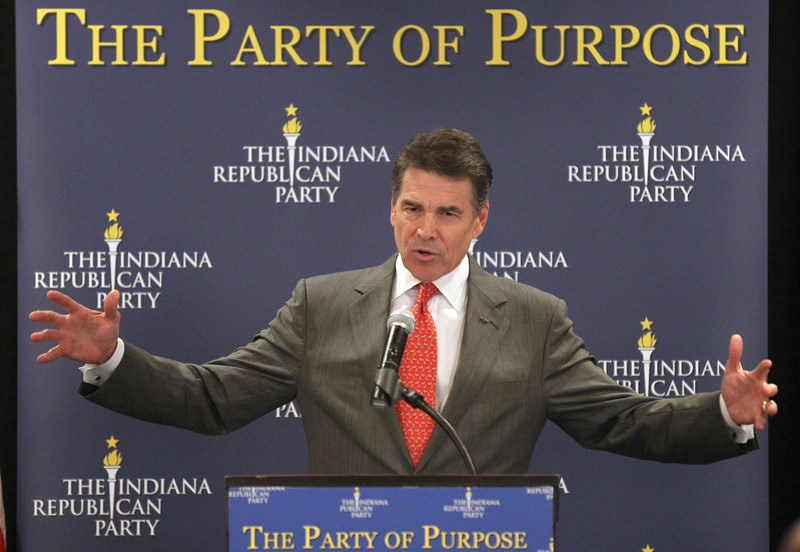 Indiana will certainly be a Republican target in the 2012 election. Although the state narrowly went for Obama in a 50 percent-to-49 percent split in 2008, it was only the first time the state had gone to a Democrat in nearly 45 years. And the state's governor Mitch Daniels, a one-time presidential prospect, still won his election that year, 58 percent to 40 percent. Daniels will be a sought-after endorsement for the candidates, which is perhaps the reason that flattery was in the air. "You've got one smart governor in Mitch Daniels," Perry told the crowd. "You've got a brilliant governor."